Singapore is an absolutely fascinating country in Southeast Asia with a large amount of unique travel experiences, an incredible skyline filled with impressive art-deco skyscraper buildings and an abundance of mega shopping malls, fine dine restaurants, world-class museums, religious temples, tropical landscapes and fun-filled theme parks, all which have made it the beautiful and energetic destination that it is. Singapore is an incredibly diverse nation in terms of culture with four official languages and several ethnic enclaves, which means that there are several fun festivals and cultural events celebrated here and plenty of lip-smacking international dishes to sample including Chinese, Indian and Malaysian specialities, as well as fusion dishes which have made Singapore into one of the world’s top food capitals. Brightsun Travel offers a wide range of cheap air tickets to Singapore which are available all year round, so if this city sounds like your type of travel spot, why not browse our website now and grab yourself a great deal? Singapore is a land of many wonderful tourist attractions; amongst them are the breath-taking Gardens by the Bay, featuring more than one million plants and Universal Studios Singapore, Southeast Asia’s only Universal Studios theme park home to over 24 rides and attractions. The Merlion Park Statue at Marina Bay is another must-see landmark in Singapore with the head of a lion and tail of a fish, symbolising the nation’s history. Why not head for an exciting Singapore shopping spree? There are plenty of malls, boutiques, bazaars and department stores to browse, promising something special for all budgets. You could also take a tour of Singapore’s endless museums, dedicated to everything from history and culture to science and art. The National Museum of Singapore is a must-visit, with spellbinding architecture and a fascinating collection of exhibitions that illustrate the city’s history. Once you’ve explored to your heart’s content, you just have to experience Singapore’s amazing night life; there are plenty of clubs, karaoke bars, cocktails lounges and pubs to spend the night. 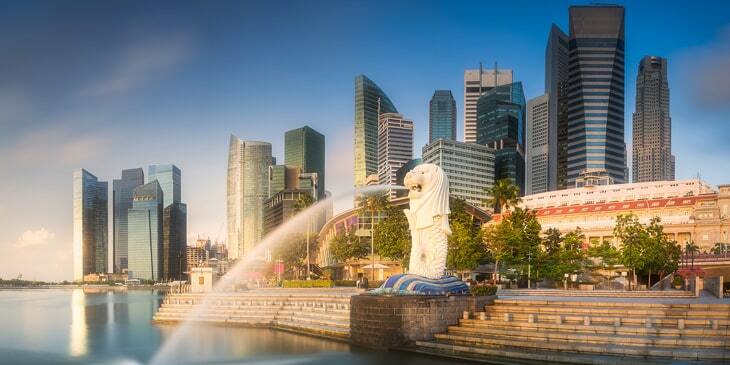 Book cheap Singapore flights from India with Brightsun and look forward to exploring what this incredible city has to offer.